The end of the global "commodities supercycle" (see post) has been devastating for a number of nations with significant natural resource export sectors. Over the past decade, the rise in commodity demand and prices has often masked structural issues in many of these nations and delayed much-needed reforms and industry diversification. When the good times ended, a number of countries were caught unprepared. Some argue that the impact is not limited to emerging markets and includes to some extent nations such as Canada (see post) and Australia (see post). Despite the relative stability , there remains enormous structural headwinds to growth. Limited power supply (state-owned power company is struggling to meet demand , with existing fleet on average 30 to 40 years old) and inflexible labour markers. GDP growth this year could be 2% or less and with commodity prices falling , current account deficit will average 5% - 6% of GDP .. However, the biggest challenge is unemployment ( officially 25% but above 30% including discouraged job-seekers ) .. This creates enormous socioeconomic and populist pressures which the ruling ANC is struggling to contain .. In my view it was a mistake for the ratings agencies to give SA an investment grade rating in the first place while the unemployment rate was/is so high. ..
With commodity prices declining, the nation's export sector has been struggling. At the same time foreign investment growth remains quite weak. This resulted in a sharp decline in South Africa's current account (reported yesterday.) The number came in at -6.3% of the GDP, far worse than expected. As the nation mourns the passing of Nelson Mandela, the realization is sinking in that South Africa is facing growing economic and political uncertainty. And ironically, the stronger economic data out of the US creates further headwinds by lowering demand for rand and South African government bonds. Bloomberg: - Traders are turning more bearish on the rand after the currency’s slide this week to a more than 4 1/2-year low, sparked by speculation the Federal Reserve will start curbing stimulus sooner than anticipated. Foreign investors, who own about 37 percent of South African government bonds, dumped the debt for 12 straight days through yesterday, the longest run since Bloomberg began compiling data from the Johannesburg Stock Exchange in 1996. 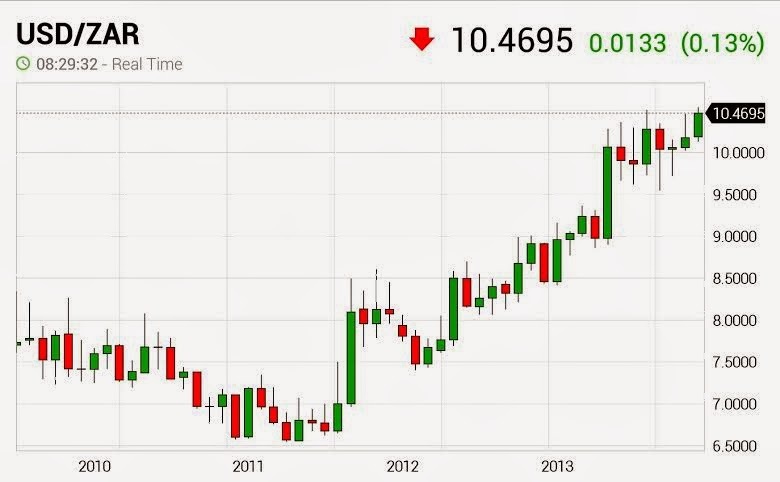 The chart below shows long-term trend in the rand (USD/ZAR) exchange rate against the dollar. Note that the chart shows dollar appreciating and the rand weakening.